It's no surprise that in the last decade we've seen an evolution in the use of media and technology across the board, particularly in the usage at events. As social media has taken over and chatter has grown, PR, Marketing and Advertising strategies have had to get increasingly more clever to continue to raise the bar and break through to their audiences. Our client, HSMAI (Hospitality Sales and Marketing Association International) has been awarding work in these areas (as it related to travel and tourism) for over 30 years at their annual Adrian Awards Gala. With increased usage of technology and social media, comes the increased challenge of meeting the seasoned expectations of the attendee. Long gone are the elaborate paper and cardboard displays of signage. That's so 2005! 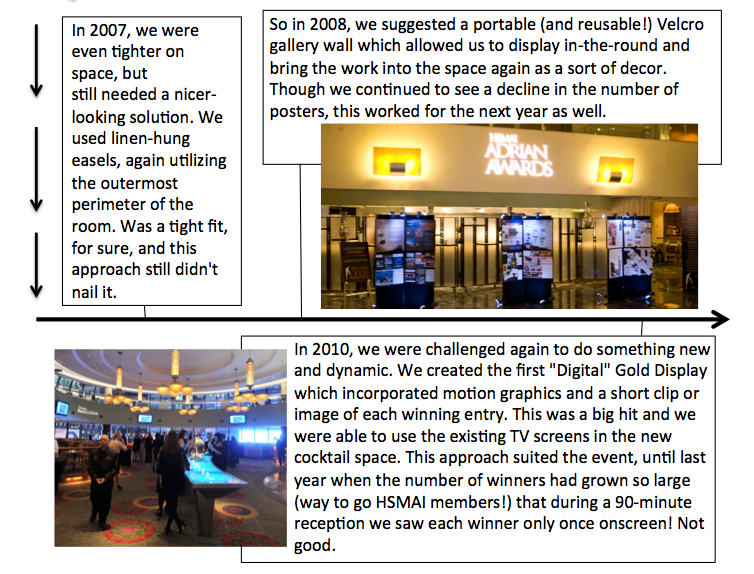 This year, Sequence answered the call of the rapid technology evolution to solve our clients creative quandary as to how best to display the winning Gold entries at the Adrians' cocktail reception and encourage interaction - *gasp* - without the unsustainable (and uncreative) usage of pop up signage. A) Create a printed piece or magazine featuring the work. B) Create a mobile app for browsing on-site, setup individual kiosks on tablets and consider large touch screens around the space for a larger experience. 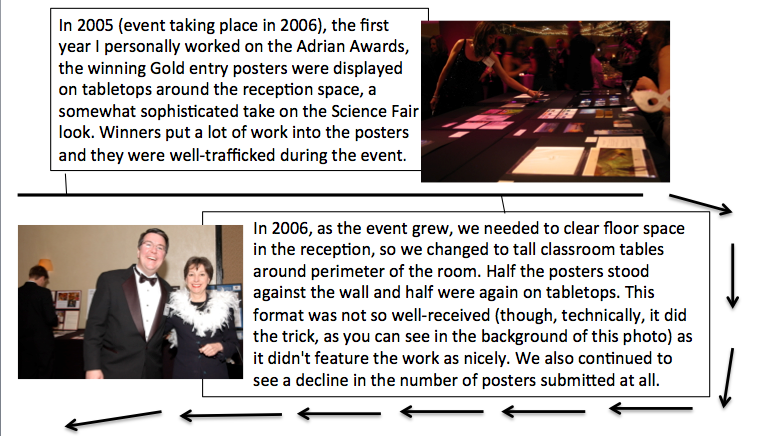 C) Instead of featuring the work, focus on the winners in the room and tag them with a ribbon or a medal for more visibility. The winner was B, to create a visually appealing and easy to use mobile app to display at several stations throughout the event. This would allow easy searching, browsing, and viewing of the winning material. We wanted this to be usable on all platforms and also on the web so it could have a sustainable life post-event as well. Guests enjoyed the Digital Gold Display immensely! Out of 800 Attendees, about 150 perused the app for varying lengths of time, and feedback was overwhelming positive.